September 17, 2018 – Calgary, AB – The Energi Simulation / Frank and Sarah Meyer Collaboration Centre at the University of Calgary, in partnership with MindFuel (Science Alberta Foundation), is pleased to announce its NSERC PromoScience grant which will be used to develop virtual and augmented reality-based content (VR/AR). 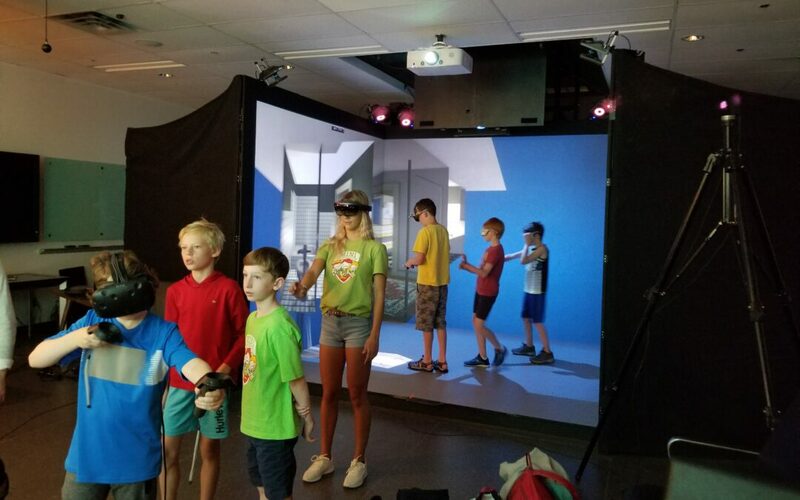 Specifically, building on the knowledge and experience of The Energi Simulation / Frank and Sarah Meyer Collaboration Centre and their 3D immersive CAVE, the PromoScience grant will enable the development and delivery of a virtual reality experience to classrooms across Canada. The VR/AR project has been developed in conjunction with a grade 6 classroom at Kulik llihakvik Elementary in Cambridge Bay, Nunavut four lesson bundle on the Study of Living Things, and will bring powerful experiences to the “Study of Living Things” curriculum. Using VR to provide an immersive experience to explore the ecology of the Arctic waters is a showcase example of the potential of VR/AR technologies in classrooms. The lessons and prototype VR experience (which will be delivered with an Oculus Go) will be utilized in the classroom in October along with an evaluation of the impact of the VR and lesson in a remote community. The VR concept is to explore the eco-zones of the area (e.g., arctic waters/tundra) and their subzones (e.g., shoreline/underwater) by providing an immersive experience into these zones and what types of organisms are present. There are seven eco-zones in Canada with those eco-zones further broken into 20 subzones. The number of zones allows opportunity for growth of the application within the same framework and, therefore, to have widespread appeal across Canada. Students will be able to interact and select specific organisms found in the specific zone and observe further information on that particular flora or fauna. During exploration, students can zoom in and out to see both large mammals (i.e., whales) and microscopic items (i.e., plankton). Students can interact with species they see by selecting them to see a more detailed view, which could allow students to change the view of the species to showcase various systems (i.e., skeletal, nervous system, circulatory system, cells for plants, etc. ), which they could use as information in a classroom classification activity. The director of the Lab is Dr. Chen, one of Canada’s Top Reservoir Engineers and Industrial Mathematicians and winner of the 2017 NSERC Synergy Award and CAIMS-Fields Industrial Mathematics Prize. Through his service to the community, the Lab ensures youth experience the thrill of applied math, science and technology in the dynamic growing VR/AR world. He is committed to sharing technical expertise and working to provide VR/AR to youth in remote communities through collaboration with experts. “Canadian parents know: youth across the country are compelled to be immersed in virtual worlds. The Energi Simulation / Frank and Sarah Meyer Collaboration Centre at the University of Calgary knows why – it’s cool! We are pleased to partner with this amazing team, and tap into their unique VR and AR Lab in combination with our highly engaging programs,” says Cassy Weber, CEO, MindFuel. NSERC invests over $1.2 billion each year in natural sciences and engineering research in Canada. Our investments deliver discoveries—valuable world-firsts in knowledge claimed by a brain trust of over 11,000 professors. Our investments enable partnerships and collaborations that connect industry with discoveries and the people behind them. Researcher-industry partnerships established by NSERC help inform research and development and solve scale-up challenges. NSERC also provides scholarships and hands-on training experience for more than 30,000 post-secondary students and post-doctoral fellows. These young researchers will be the next generation of science and engineering leaders in Canada. PromoScience provides financial support for organizations working with young Canadians to promote an understanding of science and engineering (including mathematics and technology). This hub for advanced visualization and analysis provides vital space, expertise and leading-edge technologies for the Reservoir Simulation Group, faculty, researchers and students of the University of Calgary and the broader community of Calgary. This research lab allows students, researchers and industry partners to work in a collaborative and unbiased facility to integrate advanced technology, tools and techniques in order to address simulation and visualization challenges. This includes the integration of augmented reality, virtual reality, machine learning, artificial intelligence and big data techniques to deliver next-generation applications. For more information visit the Reservoir Simulation Group at ucalgaryreservoirsimulation.ca, or the lab website at collaborationcentre.ca. Established in 1990 by James (Jim) Gray, O.C., as Science Alberta Foundation, MindFuel is a registered charitable organization focused on creating future generations of innovators and problem-solvers – directly related to helping Canada diversify its economy through a focus on STEM education and career paths. (STEM – science, technology, engineering and math.) MindFuel supports teachers with award winning programs and helps immerse students in the fun world of STEM through blended learning, which includes both digital and hands on training, critical to advancing Canada’s Innovation Agenda. For more information on programming, please visit mindfuel.ca. Click to view this announcement in PDF.